This is our last week in the field. All the squares are coming along nicely, and many are preparing for final photos. Final photos require each square to be totally cleaned, which is an interesting process because everything is made of dirt and covered in more dirt. The task is to clean the dirt from the dirt. But as we clean, we begin to notice small things that we couldn’t have seen at first. Trenches and missing pebbles- maybe there was a wall here? A layer of plaster- what was the floor like? 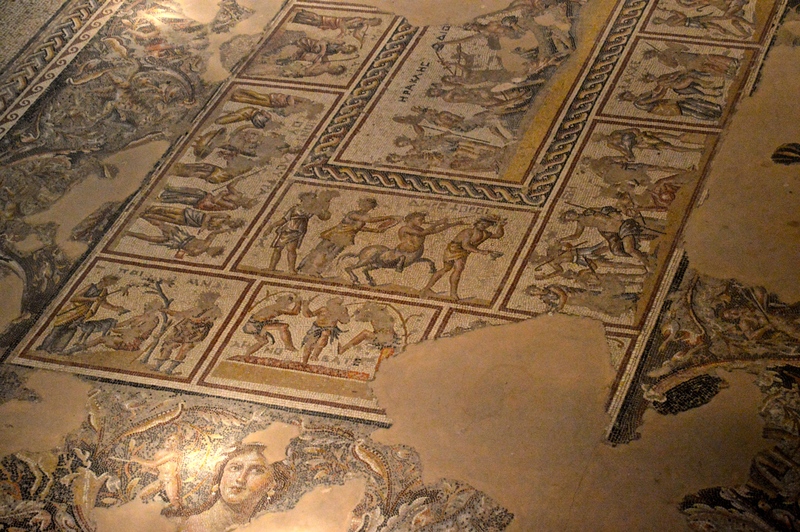 Thousands (literally thousands) of cubed tesserae- was there a mosaic? The view from the top of the cliffs at Gamla. After digging, we head back for pottery washing. As many of the squares have hit bedrock and are not finding much pottery, the task is short. (Shout out to Square J17 for washing all the pottery today!!) People staying at the Kibbutz for holiday are interested in our project, and they ask us questions about the site as we wash pottery in the yard. Hiking groups come by to visit while we are excavating, and the fit outdoors people of northern Israel go for long bike rides up the hills behind the site. The work goes by fast, the gnats have went away, and we know what to look for in our squares to help us figure out what was happening there hundreds of years ago. As the trip goes by, we are doing more and more excursions. We visited Gamla, an ancient city on a cliff wedged between two valleys. It overlooks the Sea of Galilee and Griffin Vultures fly by. In Tiberias, the Sea of Galilee is always close by and the restaurants offer an amazing variety of food from fish to lamb to schwarma. In Zippori/ Sepphoris, the empty aqueducts showcase an exciting caving-like experience and horses graze on the grasses around the site. Inside the ruins, fantastically preserved mosaics show the history of the Nile River and magnificent scenes of battles and creatures. We are getting excited for our big trips to Akko and Jerusalem, and are looking forward to looking at the finished product of our squares soon!